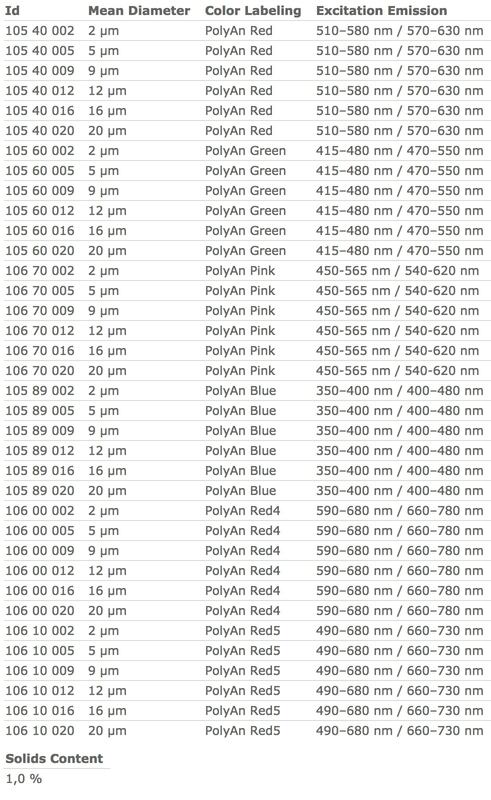 PolyAn’s fluorescent microparticles are available in various sizes, emission spectra and fluorescence intensities. The fluorescent PMMA microparticles are suitable for use in flow cytometry, fluorescence microscopy, phagocytosis studies and cell labelling. They can be used in image based systems as well as in other screening applications. Typical applications include calibration of flow cytometers, calibration of fluorescence microscopes and multiplex bead assays. With PolyAn’s production process up to two fluorophores can be incorporated into the beads during the bead polymerisation process. This ensures a much more homogeneous distribution of the dyes within the beads when compared to conventional diffusion controlled dyeing processes. Additionally, the fluorophores are caged within the polymeric PMMA matrix and are less likely to leak-out. Please note, that all microparticles can be produced in sizes between 2 – 20 µm. It is certainly possible to tailor the fluorescence intensity to your specific requirements. PolyAn also produces customised microparticles which incorporate fluorophores for other spectral ranges. Customized coupling of other biomolecules is available upon request. Please do not hesitate to contact us!